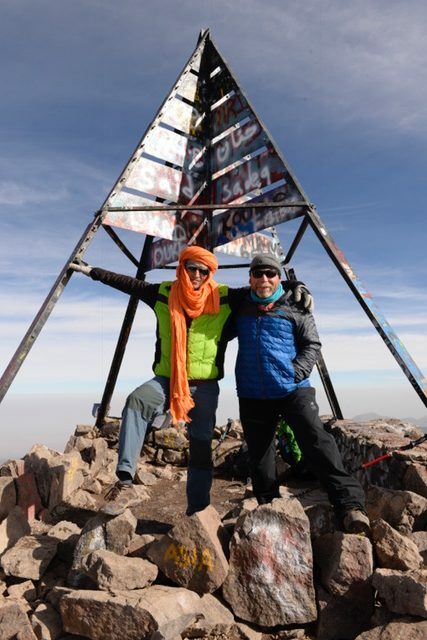 Without the help of Glenmore Chiropractic , Bobby Davis and the magic of Shockwave Therapy, I would not have been able to do a 5 day long distance hike in Scotland and 6 day trek in the high Atlas Mountains in Morocco finishing with summiting the the highest mountain in North Africa!! My Plantar Fasciitis had become so painful it was hard to even walk. I went to Physio, had custom insoles made and even though both provided some relief, it was Glenmore Chiropractic and shockwave therapy that made the last 3 week adventure possible!! I suffered with calcific tendonitis and bicep tendonitis for over three years making even daily tasks like getting dressed painful. When other treatments failed to provide any relief I signed up for four treatments of shock therapy at Glenmore Chiropractic Clinic. About a month after these four treatments I felt almost a ninety percent improvement. I still get the odd twinge, but otherwise, I can kayak, paddle a canoe, and get dressed pain free. The constant dull ache that was in my shoulder is totally gone. I have recommended this treatment with Dr. Harris to others, and will continue to do so. I must say the office staff is great too; friendly and professional! The services I have received at Glenmore Chiropractic have been among the best in terms of quality and fundamental in my return to health. When my injury would respond to no other treatment, Dr. Harris was my last resort. Ryan and the awesome staff provided not only a focused and professional atmosphere but were also friendly enough to make me feel welcome and hopeful in the midst of an extremely tough situation. I highly, highly recommend Glenmore chiropractic to anyone and everyone who is seeking treatment for injuries or simply general maintenance. Thanks again Bernice, hopefully I will be able to come visit you guys sooner than later. In the mean time, take care! I have been having an on going elbow pain that's been affecting me with Football and just everyday life such as work! I had tried quite a few different treatments over a long period of time but nothing compares to the results I received from Shock Wave! Compared too how I was feeling at the start of my football season I would say I had about 90% success rate after my treatments. I would defiantly recommend shock wave therapy not just too an athlete but Anyone! The staff at glenmore chiropractic were amazing as well! They made it really easy to book a appointments and answered any question I had! Defiantly a place I would go back too. The treatments are very helpful. Now I can raise my arm and am golfing full time. I am so grateful to you and to my friend for telling me of his success being able to play ball again. This adds so much enjoyment to our lives. I have had foot pain for several years now on the ball of my foot which was affecting my toes. The pain was so bad it would stop me from walking. I had a family wedding in July and danced 3 dances and couldn’t do anymore. My wedding was coming up in 3 weeks and I was really worrying about that. Then I saw the ad in the newspaper and called Glenmore Chiropractic about the shockwave treatment, I had seen that there were many positive results from their patients. I booked all I had time for before my wedding and thank goodness I made that phone call because after just 3 treatments I danced all night at my wedding!! I am very pleased with the shockwave treatment I received. Nothing else in the past few years has helped as much. I am about 90% better. I have finally found relief from my plantar fasciitis due to the shockwave treatments I received from Glenmore Chiropractic Clinic. Dr. Harris and Bobby Davis are very friendly, helpful and encouraging. They targeted the areas of my feet that were giving me problems and I can now complete a full day's work without feeling the pain I once had. I am very pleased! Every treatment of shockwave was like taking that giant leap forward in terms of recovery. The moments in between would be invested in waiting for the next great leap towards ultimate recovery and health delivered by the next shockwave treatment. The coupling between what may be the finest quality in chiropractic service in the Okanagan, and the innovation and deliverance of shockwave treatment, will be the most rewarding investment a person can make on the road to recovery, health and vitality. I don’t remember the name of the machine I was using at the gym several years back, but I distinctly remember the “popping” sound that followed… and so began my long journey of healing. Sure, popping sounds great when you are eating Rice Krispies or making popcorn, but when it’s coming out of your shoulder, not so much. Over a short period of time my shoulder problem grew to be debilitating and radiated to other parts of my body including my neck and arm. Didn’t take long to over-compensate leaving my other shoulder screaming for relief. Here is where the healing process started, and came to an abrupt halt. With a combination of frustration over misdiagnosis, losing hope over trying all available options with no results and a husband growing tired of rubbing my shoulder every night, I came to the conclusion that it was going to have to be something I learned to live with. Then I moved to B.C. 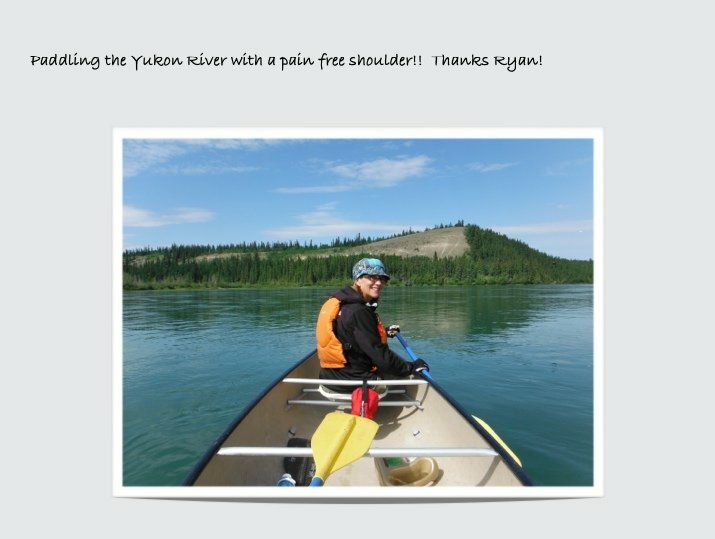 I had seen the “Glenmore Chiropractic” ads in the Daily Courier many times over and my curiosity over his Shockwave Treatment Therapy gave birth to some new hope that perhaps it was worth trying once again to find a solution to the shoulder pain problem I was now enduring daily. I couldn’t sleep on it, move my arm and as each day progressed, I would experience everything from numbing sensations to sharp pains. a chance to feel notable results in just one treatment but my expectations were blown out of the water. I not only felt increased mobility and pain relief in that first treatment; with each treatment that followed, I was able to feel more and more like the pain free person I was ten years ago. The treatment was actually enjoyable too, go figure. I have been recommending Dr. Harris and Shockwave Therapy ever since. You can wait like I did, but why? Get your life back, now. And a last word of advice…have an expert tell you how much weight you should lift at the gym. The shockwave therapy treatments I undertook were very helpful for my left shoulder tendonitis. I had completed massage therapy, physio and active release prior to commencing shockwave. In my case, the first two treatments really hurt a lot and I almost ceased this treatment avenue. I'm glad I continued because thereafter, I was able to tolerate the treatments much better and finished a few treatments later with improved mobility and strength. A few months on, I remain mindful of this left shoulder and I've learned to dial the intensity back for exercise and work while maintaining a daily routine of shoulder strength and mobility exercises. I believe that shockwave therapy works well in conjunction with the other forms of treatment mentioned above for a variety of shoulder problems. I am please to provide this testimonial. I am very pleased at the results of the Shock Wave Treatments with 100% of the pain gone. I only have a bit of tightness in the neck and shoulder but should release with some stretch exercises. The first treatment did not do much but the next two treatments had some good results. Every treatment after the third treatment gave me good results and diminishing pain. I would suggest to your clients to give shock wave treatments a fair try, as it might not show results right away. My neck was in extreme pain, some said SWT would not work very well for neck pain, I am very fortunate to have given SWT a chance to work. I am now pain free and will recommend SWT to everyone because no one should suffer through that type of pain. Thanks for your email. I am soooo pleased to advise my 3 shockwave therapy sessions has completely cured my Planters Fasciitis. I’m back playing tennis and feel I have my life back, Yahoo!! Please, please let Ryan know and give him my best. I have referred lots of people for shockwave, hopefully some have booked with your office. I am 66 years old and I had six shockwave treatments last summer and am now 100 % recovered from tendonitis in my left shoulder. The pain got progressively worse to the point where I couldn't sleep on that side and was having trouble getting dressed. I tried two sessions of physiotherapy, but the pain was becoming unbearable. I was a little skeptical, but decided to try shockwave treatment out of desperation. As recommended between the treatments, I was careful not to sleep on that side or do anything strenuous with my left arm. After the fifth treatment I was then able to sleep normally and started increasing left arm exercises. My shoulder seemed to get stronger with every week that passed. I can now play tennis, exercise with hand weights, do plank for five minutes and am completely pain free thanks to this amazing treatment....thank you! PS: I brought my iPod with me to play music during the sessions to help me relax - this was especially useful for the first few sessions when I was in a lot of pain. I would say my shoulder is 100 % better than it has been so far. I am a career advanced care paramedic/ firefighter so I have to be able to perform in a variety of physical situations. Over 20 years ago I was playing goal in ice hockey and dove to make a save which injured my rotator cuff badly. No I did not even make the save. I saw a sports Dr who said I would not benefit from surgery. So I did some physical therapy which didn’t help that much. I have been suffering with that shoulder off and on since. It gets to the point where I have to limit my weight lifting. About a year ago I injured the other shoulder doing some heavy landscaping, the landscaping does look nice though. Now I had 2 injured shoulders. I saw an ad for shockwave therapy and decided I might as well give it a try as others have benefited from it. The one shoulder I injured about a year before felt great after the treatments but to my surprise the one I injured over 20 years ago felt great also. After the treatments I have been able to resume my weightlifting and exercising normally without any pain. I can do my job with no concerns or taking pain meds. I just wished it would have taken 9 strokes off my golf game. Would and have recommended shockwave to people. The staff, Dr and office is great also. Shock Wave Therapy ... I wish I’d known about this a year ago! In February, 2014, out of the blue my shoulder began to ache... Physiotherapy 3x/wk for two weeks did not help and my pain increased so I returned to my doctor who prescribed me stronger pain meds with anti inflammatory properties. I then tried acupuncture every other day. On my 3rd visit the acupuncturist told me that I have nerve damage so she sent me to a “Pain Clinic” where I saw a sports medicine doctor who took X-rays & showed me more stretching exercises to do. After another week of constantly increasing pain I ended up seeing an orthopedic surgeon whom I begged to prescribe me stronger pain medication because my pain had become absolutely debilitating. I could not get to sleep nor stay asleep and would wake up in pain hours before I needed to go to work. I could barely work & I was completely exhausted all of the time. I was told by the surgeon that the medical profession doesn’t know what causes Frozen Shoulders and doesn’t have any cure for them. My job moved me to Kelowna where I saw Ryan Harris’s news paper add and I cut it out but did not look into it any further. I was very skeptical ... However, my pain was increasing and overpowering my skepticism and my wife told me that I had nothing to lose so she booked an appointment for me. On my very first visit to Dr. Ryan Harris, almost immediately I started feeling the range of motion coming back to my shoulder. It got better and better after each Shock Wave treatment and more importantly my pain level was decreasing for the very first time in a year. After my second visit to Dr. Harris, I decreased my need for prescription pain medication by 50%. After my 4th Shock Wave treatment I no longer needed to take my pain medication and I also stopped taking sleeping pills because I didn’t need them as I was returning to a normal sleep cycle. My overall mood was hugely uplifted once I stopped taking the prescription drugs. In May 2015 I started going to the driving range. In June I played my first full round of golf... pain free! I highly recommend Dr. Harris and his Shock Wave Therapy. I only wish I had met him much sooner. I had been having pain and numbness on the inside of my elbow for approximately 1 year. I thought this was going to be a chronic condition that I would have to learn to live with. My doctor said considering my occupation as a medical transcriptionist and the repetitive motion of typing, other than applying ice, taking Advil or quitting my profession, there was little else he could do to alleviate the discomfort. One day I happened to walk past Glenmore Chiropractic and noticed the sign advertising ESWL and decided to give it a try, although I must admit I was somewhat skeptical. Ryan was very professional and explained in detail what to expect and how ESWL works. After receiving multiple treatments 4 years ago I can contest that I am pain free, able to perform my job without discomfort and can play 18 holes of golf with ease. Thanks Ryan. 3 treatments for spur in heel of foot and gone. I have an extremely physical job as a landscaper and Ryan has made my job a lot more comfortable. Highly Recommend. I suffered with plantar fasciitis for over three years. I tried numerous avenues to relieve the pain but nothing helped. My physical activities became severely reduced and with that came new problems. After just three shockwave therapy treatments, the fasciitis has completely disappeared. I suffered with tension headaches on a daily basis for over three months. After just one shock wave therapy treatment on my neck, my R.O.M. increased instantly. I am happy to say that after my second shockwave treatment followed by a massage in the same clinic, I no longer have headaches. I am also experiencing relief from the discomfort of my scoliosis with a combination of shockwave therapy, chiropractic treatment and massage. Thanks to Dr. Harris and his team of professionals I am regaining my mobility as well as my lifestyle. There is a solution...shockwave therapy is inexpensive, non-invasive and it works!!!! Thank you for your friendly and upbeat email - just like Ryan and yourself in your pleasant office surroundings. I am doing very well following my shockwave treatments and couldn’t be happier. What a difference to be able to walk properly and not walking on the side of my foot to avoid the pain. My recovery number based on Zero to 100% improvement would be 100%!! After two identical surgeries in the arch of my left foot, 9 and 7 years ago, I have had a great deal of pain and had to quit walking, hiking and resorted to swimming and cycling instead… this shockwave treatment is like a miracle. I am so grateful to Dr. Ryan Harris for giving me the ability to use my feet properly again, thanks to his shockwave therapy, which created quite a sensation on the tissues of my foot at the time, but has restored full use of the foot. All the best to you and Ryan, and thank you for the pleasant experience. All the best to you Bernice and Dr. Harris. Where should I start? In the summer of 2011, I began to feel some pain in my right shoulder. I went for a massage and when I came out, for the next 3 months, I was completely disabled and was in excruciating pain. I have been enjoying a successful career as a professional illustrator fine artist for the past 30 years. When I was struck with this debilitating injury my career came to a grinding halt as I could not manage to do the things I needed to do in my studio to create the paintings that I wanted. This only added to my frustration and depression. Then at the beginning of 2013 I was diagnosed with follicular lymphoma. I spent the next 8 months going through chemotherapy. While the chemotherapy was successful in putting the cancer into remission the main side effect was the drugs attacked my joints especially my shoulders and I was right back to square one again. So at the beginning of this year 2014, I was at my wits end. After a visit to my shoulder surgeon, the reality began to set in that I was in for many long painful years. The surgeon basically put me on a two year waiting list and gave me absolutely no guarantee that he could fix anything. So here I am in February of this year taking handfuls of painkillers and trying everything I can to help the situation and stay somewhat positive but to no avail. Depression began to set in again. Soon after this I saw an ad in the newspaper for a new treatment called shockwave. At this point I had nothing to lose so I made an appointment and began treatment. After the first treatment I was astounded to see about a 50 to 60 percent improvement in mobility and reduction in pain. You have to understand that my shoulders we're in really bad shape to the point that I could not lift my arms above shoulder height without terrible pain. So I continued with the treatments. After about 6 to 8 weeks of treatments I was thrilled to see my shoulders with about an 80% improvement! At this time I am enjoying about a 90% improvement over when I first came in to see Dr. Harris and the pain is now manageable. To think that I would have had to wait two years on a surgical waiting list with no guarantees of anything getting better, as well as countless amounts of painkillers, this treatment has been a real Godsend! I am extremely grateful to Dr. Ryan Harris for his foresight and belief in this breakthrough technology enough to bring it to Kelowna. Thanks for the follow up. My feet are doing quite well. Not 100% but the best they have been in at least the past 6 to 8 years. I would be delighted to provide a testimonial. In fact I would be happy to go live on TV and tell everyone in the world with feet problems to go for this treatment. I can’t believe I haven't been told about this before. I have suffered for years to the point of feeling crippled and now my feet are so much better and I am able to walk around without crying. I’m not pain free yet but I truly believe that will happen soon. I have been telling everyone I know about the treatment and Glenmore Chiro. I would gladly and willing stand up and praise the results I have experienced from the treatments. Use my name and tell people to call me if they have any doubts. I know I did when I first went. I was skeptical because no one has ever had a solution and I have always been told I would have to live with it and my only option was pain management. Now I believe differently. This has been life changing for me. 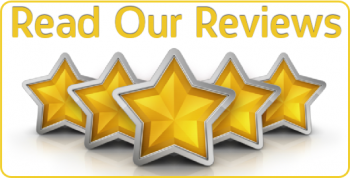 "I am 100% satisfied with the care I received at Glenmore Chiropractic. My case was specific to significant amounts of scar tissue in my shoulder and back; after five years of dealing with pain I finally found a treatment that worked. It is an immense relief to find a solution to an ever present problem; I would recommend this treatment without hesitation." I suffered from shoulder and upper arm pain in both arms for 2 years. Other treatments weren’t working and the doctor suggested surgery as the only alternative. My rotator cup were worn out from overuse, with a lot of scar tissue. Wait time would be 2 years or more. This was not an option for me. I received 2 SWT treatments from Dr. Harris and immediately after the first treatment I had less pain in my shoulders and arms. After the second treatment I was 90% pain free. I was able to sleep on my side without waking up from pain. I was a skeptic but am now a believer. My knees are feeling terrific! I have my normal gait back thank goodness. I couldn’t be happier with the results there’s no doubt about that. I would have to say my recovery is 95% at this point, and every chance I get I always rave about Ryan and the rest of your staff and especially the shockwave treatment that “saved my life”. I’ve probably referred 40 or 50 people your way so far……I hope most of them visited your office…..LOVE Glenmore Chiropractic! Hi to Ryan and the team. I am so very satisfied with the treatments you provided. On a scale of 0-100% I have to say 100%. I am aware that I have a heel spur; but as long as I wear proper footwear I no longer have any noticeable pain. As you know; I walk on a very uneven tile floor, pavement and concrete 8 hours a day. Before I came to you I was in tears daily from foot pain. And lived on pills; just so I could go to work each day. After the first treatment I walked all the next day with no pills and minimal pain. By the end of the 4th treatment I was a new person. That was a month ago and still no pain, no pills. So thanks so very much. Of course you can use this as a testimonial if it fits. And go ahead and use my name if you like. I have told everyone I know why I'm walking without a limp and am not so grumpy. Both Margaret and I (Don) are completely recovered from our rotator cuff injuries and spreading the good word to all of our acquaintances in Osoyoos. Please feel free to use our last names, if you so desire in any testimonials, which I think of as a boon to society. Thanks, Ryan, for allowing me to swing again - the golf game is coming back ( shot 79 not too long ago ). O.K for an 83 yr. old - eh?! Also thanks for the graciousness of your staff. It was much appreciated. My recovery has been amazing. I have NO pain or tingling in my fingers since the second treatment. I am very happy with my treatment. It is 100 percent successful. Please use my testimonial. Dr Harris treated my arm for tendonitis and I am very happy with the results. My range of motion has improved 100% from before I started treatments. Thank you also for the good service from the receptionist, Bernice. I definitely had improvement in my knees following the shockwave treatments. After four on each knee, I had at least an 85% improvement, and my knees continued to improve even more in the following weeks. I previously had difficulty walking down stairs, and would have to put both feet on each step before going further. Now I can walk in a normal way down stairs without any difficulty at all. I would certainly recommend the treatments to anyone that is having issues that can be treated with shockwave. It also has the advantage of being “non-invasive” and has no downtime afterward. As an added note – my husband had received shock wave treatments on his elbow some years back when that method first became available in Montreal. It was a huge improvement on his elbow, and he recommends it also. Thought I'd let you know that since my last Shockwave treatment in Oct/13 I have been pain FREE, thank you very much. Must add it has also improved my golf game, how good is that?! Hello Ryan, Bernice and everyone at Glenmore Chiropractic! It's been about a month since my last treatment, and I can enthusiastically say that every day, my shoulder feels a little better. The improvements experienced were nothing short of amazing. After physio-therapy, acupuncture and conventional chiropractic treatments did nothing to alleviate the pain and immobility I suffered from "frozen shoulder", I decided to give Shockwave treatments a try. At first, it didn't seem to help much, but all of a sudden, the shoulder loosened up and I was able to move again. I'm still not quite 100%, but each day feels a little better and I'm hoping that with time and perhaps another couple of treatments, I will be back to the range of motion I had before. I have recommended Shockwave treatments to at least one of my friends who seems to be suffering the same symptoms that I did, and I will for anyone who is having difficulty with pain and ROM issues. Thank you so much for giving me my shoulder back! As the song says "you don't know what you've got 'til it's gone", but it's great to have it coming back! After living with a debilitating shoulder ailment over an extended period of time, and after reading about the Shockwave Therapy Program being offered through Glenmore Chiropractic Inc., I made my way to their office to learn more about this treatment modality. As a result, I made the decision to undergo such threatment and, from beginning to end, found that I was dealt with in a responsible and professional manner. The results were very much in keeping with the positive hoped for results spelled out at the beginning and end of each session, and have persisted over time. Therefore, without any hesitation or mential reservation whatever, I recommeded the Shockwave Treatment Therapy, administered by Dr. Ryan Harris to persons suffering from shoulder ailments similar to my own. Since 2001, I have been unable to walk for any more than 45 minutes to an hour, or put constant pressure on the ball of my right foot. In the last 9 years, I have been to 2 Podiatrists and have been prescribed different insteps supposedly to correct the problem to no avail. My husband noticed that Dr. Harris' practice was offering a new treatment for Musculoskeletal Conditions, a problem I felt I had. I made an appointment right away to have a consultation, with Dr. Harris, who examined my foot and felt that the treatment would definitely help me. I began Extracorporeal Shockwave Treatment right away, and after the first session I was able to hike on a camping trip we left for the next day. After the first hour I had a little trouble, but it went away quickly, and was able to continue on. After the second treatment a week later, the improvement was amazing. I could walk and be on my feet all day with very few symptoms, but certainly nothing to slow me down. I received another treatment and still more improvement. I really feel like I am back to normal! I have not been able to walk or be as active as I now am in over 8 years; the change is absolutely remarkable. I would recommend the Extracorporeal Shockwave Treatment to anyone, as its done wonders for me. After undergoing Arthroscopic Surgery on my left knee to repair a torn ACL, I underwent extensive physiotherapy without full recovery due to chronic, muscle spasms and scar tissue. After one visit to see Dr. Harris I noticed measurable gains in pain relief along with range of motion. Finally, after completing my course of Shockwave Treatments I was at a loss for words in regards to the gratitude I had for Dr. Harris' help. Shockwave was the best therapy I received over 3 years of pain and I'm a willing advocate that it works! Due to an injury to a Rib (muscle tendon), I suffered daily pain in my back and shoulders. Over the course of 18 years I tried physiotherapy, massage, trigger point injections, regular chiropractic treatments, and pain killers to no avail. I decided to give Shockwave Treatment a try as in theory it made sense. After tempering my treatments due to my extreme sensitivities from fibromyalgia, I feel remarkably pain-free and rejuvenated; where I was only able to walk with my arm still or supported in a pocket before. I am now walking with a full arm swing I have been pain-free for 4 months. I am now looking forward to Dr. Harris applying Extracorporeal Shockwave Therapy to other areas of my body affected by Fibromyalgia. I would recommend this to anyone suffering needlessly from pain. Why pump your body full of medications that often don't work, but poison your system? I only wished I had tried this treatment sooner. I completed the 135K Vernon Gran Fondo yesterday, a challenging ride to say the least! Over 7,500 feet of hill climbing. My knees were fine yesterday and today. The treatments on my knees definitely made a difference. Many thanks. I’ve been battling patellar tendinitis for over two years and I’ve seen a huge improvement since I started shockwave treatment after my progress had plateaued for nearly a year. After three sessions, my knee strength has improved to a level that couldn’t be reached with two years of physio treatments. It has been a great experience and I wish I had known about the treatment earlier- I didn’t find out until two days before my first session and it would have been worth the four hour drive to get it done. I’m very grateful that Dr. Harris was able to come to the small community of Nelson, BC to provide local patients with big-city level care. Dr. Harris is very skilled at what he does and I want to thank him for kick-starting my healing process. Sports are a big part of my life and having my injury healed will allow me to push my performance to the next level without constantly worrying that I will cause more damage. I’ve had to modify my lifestyle to make it work for my knee and now I can live my life the way I want to. Thanks for giving me my life back! I have had a bad shoulder for almost 5 years, Being a martial arts instructor it was getting to the point that doing certain demonstrations were nearly impossible, Then I met Dr. Ryan Harris. After a quick consultation we decided that I could benefit from shockwave therapy. After only 2 sessions I noticed a significant difference and now I am back to my old self again. Dr. Harris and his office are a joy to deal with and are determined to get to the root of the problem, Not just cover up the symptoms. I have recommended many people with chronic injuries to Dr. Harris and have heard nothing but success. June 27, 2013 Cody E.
I received Extracorporeal Shockwave Therapy at Dr. Ryan Harris’ clinic in March and April 2013 for chronic Tennis and Golfer elbow in both arms. At my first appointment, the pain in my right arm was so severe that Dr. Harris’ secretary had to fill the intake form for me. This condition was completely debilitating, especially because I own a horse breeding and training farm and I could not perform any of the activities that are required to care for my horses. Twenty four hours after the first treatment I noticed that several of the trigger points in my arms had disappeared. There was a steady improvement following each treatment (6 in total) and I rate my total improvement to 85%. The pain during the treatment was very tolerable, no more severe than what I experienced when I received deep tissue massage therapy. I was very impressed with Dr. Harris’ professionalism and his dedication to helping people using this state of the art technology. I found him to be generous of his time and showing genuine compassion for my predicament. I recommend Extracorporeal Shockwave therapy to anyone suffering from chronic, debilitating tendonitis. The Shockwave Therapy as truly changed my life. I used to wear a knee brace 3-4 days out of 5, but since the treatment I still have not had to wear a knee brace. There has also been a dramatic improvement in my back and knee (other knee) pain. I may look at getting treatment on my other knee at some point, but as it stands, I believe I will hold off for a while. I have been telling a bunch of people about the treatment, so hopefully some will be contacting you soon. I am 64 years old with degenerative knee joints. You can feel small bits of bone in the joint. Prior to coming to Glenmore Chiropractic I had constant knee pain for at least 6 months. After the Shockwave Therapy treatments my knee pain subsided. I recently rode in the Penticton MedioFondo and competed 92 km in 2hours 43 minutes with no pain afterwards. I do a number of exercises and yoga to maintain my fitness. My knees are not curable but with the help of Glenmore Chiropractic I was able to mitigate the situation and return to an active lifestyle. Thank you. My shoulder is feeling fantastic. I am back! I am doing my yoga session every morning again and feel great as a result. Pain free!! It's fantastic. I am back on my mountain bike, busy with typical household chores and feeling better than I have in years. I can't remember being able to do all the "normal" activities I love without feeling that ache and pain in my shoulder. I would, and have been telling anyone and everyone how you have improved my life. I am well pleased with the results of the SW therapy. I feel no pain in my knee, and the hunting I was able to do following the treatments certainly helped to strengthen the knee as well! I am pleased to pass on the results to any one whom I encounter with knee pain and arthritis issues, and recommend your services when I do. Thanks again for providing a very effective treatment for the painful osteoarthritic knee condition I experienced.